They targeted the vulnerable again yesterday: women with babies, the vulnerable elderly, the vulnerable youth, poor people dependent on prescriptions. The well-honed spin persists: Fine Gael and Labour have rescued the country from the recklessness of Fianna Fail’s policies of the Celtic Tiger era (Enda Kenny said in Limerick on Saturday night: “Years of give-away budgets gave away nothing except our economic security, our children’s futures”); the strategy is on track with growth, job creation and prearranged funding; we are about to recover our sovereignty and independence; the promissory note is gone (Enda Kenny claimed this in Limerick); politics is changing; and “we are never going back to the culture of the Celtic Tiger, never” (Enda again in Limerick). In every single speech Enda Kenny made on budgets from the time he became leader of Fine Gael in 2002 until the crisis broke in 2008, he complained not that the budgets were give-away and giving away nothing except our economic security and our children’s futures but that they were not sufficiently give-away. Fine Gael and Labour were complicit in the recklessness that caused the crisis. There may be a minuscule growth this year and, if all goes well in the EU, some growth next year, but it is precarious. The [euro]28 billion promissory note, plus interest, is not gone, it is deferred to our children’s futures. The State might be okay “going forward” unless the banks need several more billions, which seems likely. We have not retrieved our economic sovereignty and independence. Via the fiscal treaty and the forthcoming banking union, the Government copper-fastened the forfeiture of our sovereignty and independence forever. As for any meaningful change to the political system, no way! 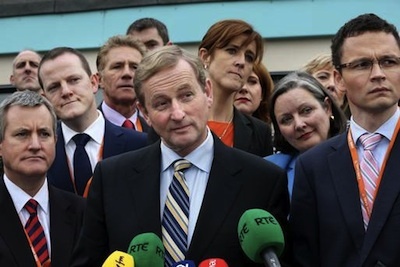 In Limerick on Saturday, Enda said: “Corporate donations have effectively been banned; Dail sitting days have increased by a third; we brought in gender quotas to get more women into politics.” Why the banning of corporate donations makes any difference is beyond me. How could it matter whether rich people buy the political system through donations through their corporations or personally? What is insidious is any private finance seeping into the political system. More Dail sittings is meaningless when the Dail itself remains irrelevant. Yes, the gender quotas represent progress but minor progress. Politics has not changed, it remains about which crowd gets the big ministerial jobs, along with the status and influence that brings. Politics is almost not at all about how society might be shaped, how wealth might be distributed (not just created), or how the sovereign people might be meaningfully involved in the exercise of their sovereignty. Politics remains fixated by the demands and rigours of markets and, crucially, by the imperative of pleasing the holders of economic power. This ordains a deeply unequal society with all the cruelties and belittlements that brings. That was the politics of the Celtic Tiger and remains the politics of the post-Celtic Tiger. The early Celtic Tiger period (1997-2002) saw a modest concerted attempt to deal with poverty and disadvantage. There was a national anti-poverty strategy in 1997, a range of sectoral strategies, for instance a national drugs strategy in 2001, a national social partnership, the Combat Poverty agency initiated national anti-poverty networks. There were grants schemes, community development programme, family resource centres, policies on child poverty. Then in 2002 the Celtic Tiger turned on all that. Funding for voluntary organisations was delayed and then cut drastically - by 47 per cent. Research funding was scrapped. The Combat Poverty agency was emasculated. And since 2008 there has devastation. Combat Poverty, the lead organisation on poverty, was scrapped and several other agencies involved in advocating for resources for disadvantaged groups and communities were closed. During this period (2008-2013), public expenditure was cut by 4.5 per cent, however local community and development programmes were cut by 42.3 per cent. The initiatives against drugs were cut from 44.3 million euro to 29.9 million euro - 32.5 per cent. Social projects for disadvantaged young people were cut by 20.6 per cent. Traveller accommodation and education funding was cut by 85 per cent. The social consequences of this are devastating - not just now but also in the long term. More poverty, drug addiction, alienation and crime, more lives shattered, more communities broken. While the wealthy remain largely untroubled. The viciousness of that strategy was replicated in yesterday’s budget. Barely a glove landed on that professional, managerial, political and corporate elite, while the old, the sick, women with babies, young people without jobs and hope were punched again and again. No reprieve for communities devastated by pervious cuts. Enda Kenny spoke on Saturday about all our people at home and abroad assisting in our national effort to build a new future, as though we were all in this together. The harsh reality is we are not in this together, there is no solidarity now, no sense that the better-off should bear the burden of the fiscal adjustment, no sense we might divide the community’s considerable wealth a bit better, actually a good bit better. The politics of the Celtic Tiger extinguished whatever solidarity there was and this Government has taken away the candle.